We are back!! Spartan Fighting Championships are back and better than ever! Better contracts, better location, better fights! SFC started back in Los Angeles and we respect everyone there but we decided that it would be in our best interest to move the location to London as we have been seeing a mountain of new talent getting a fresh start here. We are a 300k ID org so we will be looking to give the new guys a chance to get there names out there and eventually be the premier company in London. All news and previews of future events will be posted here, we at SFC strongly believe in fighters using the smack talk page as on outlet for their voice in trying to better their career here at Spartan. If you want a certain fight, tell us here! Want to voice your opinion about another fighter, do it here. This is how I notice you. No one wants a boring fighter right?? Also, we are currently opening our unrestricted ID Division for any and all fighters. If you have a fighter not under contract please send him our way. All the unrestricted fighters will be paired up according to their weight, unlike other companies, there will be no featherweight vs heavyweight fights here. Lmao I legit have no clue why this posted twice. We have three open slots as of right now, I know it's short notice but I need 1 205er (300k ID) 1 265er (300k ID) and 1 265er (299k ID) being that its short notice, I am offering a 1 fight deal, 10k flat. I can send that direct to the manager or to your fighter it does not matter to me. The 299k slot is now booked. 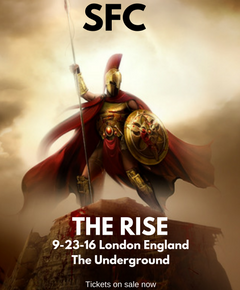 SFC 1 The Rise was the first event we have put on since starting the company back, it took place in beautiful London England, all the fighters put on a helluva show and they didn't let us down. Almost a sellout at The Underground arena the fans were going crazy for the fighters, we will for sure be back to The Underground. The Main Event featured Middleweights Leo Bow and Chris Wilson, a exciting match indeed ended rather quick! It only took Leo 1:33 to end Wilson by brutal TKO. I think Bow has a bright future here in this company. At the Post fight conference he was asked who he would like to fight next, his answer was "fight, fight, fight, I want to fight whoever!" We look forward to seeing him in his next fight. The Co main event was Cameron Johnson vs Konor MekGregor, the two Welterweights clashed for only 56 seconds! That's all it took for Johnson to wrap things up! Here is a live play by play from the announcer right when the finish happened, "Johnson is really turning it up, unleashing another crisp combination which drops MekGregor like a ton of bricks! The referee dives in to stop the fight" What a brutal series of punches that was. This man is a true threat for anyone in that division. "Reporter- "Your next rumored opponent is Steef Steefler, other rumors circulating is that, that fight could be the chance to compete for the vacant SFC heavyweight title. How does that make you feel?" 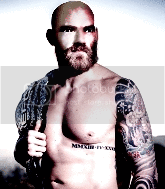 "Max- "Sure, I would compete for the vacant title. I think I have good skills to perform well in the fight against Steefler. Lets do it!" "Reporter- Question for Steef" "After that impressive submission win, everyone pretty much knows your going to fight Max Debrine for the vacant Heavyweight championship next month. How do you see that fight going? How would you prepare for that fight? Would it be any different than this fight?" "Steef- " This is the fight business, this is the lifestyle. I prepare for every fight a different way. I think I deserve a tittle shot because I have great score and all my fights is very interesting and I'm not a boring fighter .. So I am ready for that tittle, call me and I'll win it. No doubt"
Wow! so there you have it folks! Next month the Main event will be Steef Steefler Vs Max Debrine for the vacant SFC Heavyweight Championship. You heard it here first! Stay tuned for more news on that card and more! There's big things to come here at SFC. "Nothing personal Jim Rome but you're in the way of my rise to the top. Lets settle the number 1 contender issue at SFC8 so you can get back to something more appropriate to your abilities like ballet..."
6 high profile fights, including a number one tender fight for the Middleweight Championship! Two amazing undefeated fighters will be stepping into the cage to see who will go on to fight Left Ball, 5-0 fan favorite always exciting,Hendrick Vermeulen who has knocked out all five of his recent opponents, with only one leaving the first round. You can surely bet that he will be looking to do the same against Jim Rome, 4-0 fighter who has also never let go to the judges hands, knocking out all 4 of his opponents. I'm so happy that this fight is headlining the first card of the year, couldn't kick the year off any better, Someones 0 has got to go. 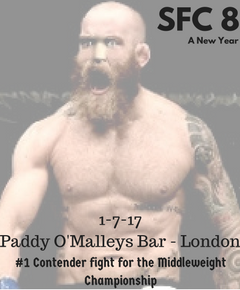 All This will be going down at Paddy O'Malleys Bar, right here in the always beautiful city of London on January, 7th 2017. "I guess some congratulations are in order but let me just make it clear I am not buying that purple tie you've been walking around town tied to waist with. Kinda sad if you think about it....but at least now you have a gold strap to cover it up. For the time being..."
Ladies and gentlemen, after 2:59 of round 1, we have a winner by way of TKO (Strikes). Lay Pray! "Convince the bosses and I'll give you your shot ... just stop the damn moaning."